Let me start with the history of the handheld radios that I have owned, and then I’ll get into my ideas of combining existing and new features into “my” perfect HT. WARNING: This is a long article. Scroll down to Part 2 if you want to get past my history bit. So I recently purchased a Yaesu VX-8DR HT package for just about $700 (this includes programming software and cable, spare high-capacity battery, quick charge cradle, speaker mic and GPS unit to enable the built in APRS). My last four HTs have been from Yaesu (FT-470 dual bander bought in the early 90s, VX-5R tri bander bought in 2000, VX-7R quad bander bought in 2006, and the new VX-8DR), and I still have all of them lying around somewhere. To me, Yaesu is where it’s at with HTs. That FT-470 was expensive when I bought it (I was in high school and anything over $100 was expensive. I’m thinking the ‘470 was close to $400, it may have been less. If Baofeng or Wouxon was an option then, I’d have probably taken it.) The ‘470 was also big. Especially when you had the good battery and the 12V charging adapter on it (picture on right is with the small battery. The big battery was about 1½ times the size of the small battery. The 12V/charging adapter fit between the radio and the battery). It was also heavy, and would make a formidable substitute for a blackjack if you held it by the rubber duck antenna. It could monitor VHF and UHF at the same time. When I really got back into ham radio back in 2000, Graham KB8SEW talked me into buying the Yaesu VX-5R. That was a fun little radio. Also expensive, but I was making real money by then. The lithium ion batteries did not add length to the radio and held a charge much longer than the NiCds I was used to. That was also the first radio that I used where the programming software was vital. It had the 2M and 440 bands but also got me into a bit of 6 Meter FM. It also had very wideband receive (I could listen to AM and FM broadcast radio and TV channel audio and I used to also string a wire up in my hotel room and pick up shortwave broadcasts). You could also put alphanumeric names on each memory location in addition to showing frequency and channel number. That was nice as I traveled frequently and some of the areas I visited had repeaters on the same frequencies. It also was easily configurable to use 12.6 kHz narrowbanding, commonly used in the United Kingdom where I worked in 2002-2003 and operated as MØDCI. 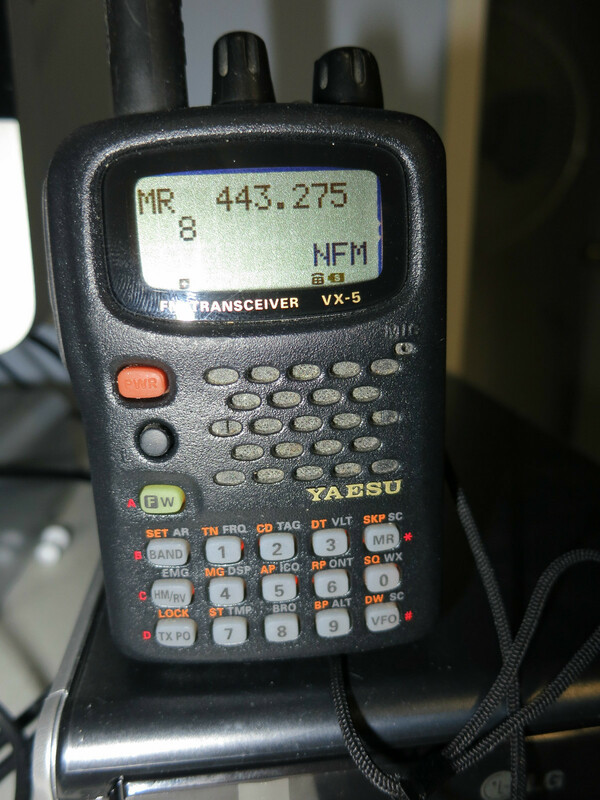 The next radio was a VX-7R that I purchased in 2006 at Dayton. This radio has traveled with me all over the country since then. It was definitely an upgrade to the VX-5, but I suppose I bought it mostly because I could monitor (almost) any two frequencies at once (the old FT-470 could monitor a VHF and a UHF at the same time, the VX-5R could only monitor one frequency at a time). It also would run 220MHz at 300 milliwatts (presumably only using exciter power and not the final amps which would be difficult to tune to 220) and also transmit AM on 6 Meters up to one watt (I never used that feature). And finally this brings me to the VX-8DR. As much as I loved the VX-7R, I wanted to get something that could handle APRS at the same time as voice, especially when I travel on business or go to Dayton Ohio or Friedrichshafen Germany for the conventions. After I play with it for a few more months, I’ll be writing a review here. So far, to me, it’s about the same as the VX-7R but you can attach a GPS and start pumping out APRS packets (If you’re interested, I operate the VX-8DR as AD8BC-7, so you can see where I’m at at Dayton and Friedrichshafen). So before I move on, I would be remiss to not mention the two HTs I had before the Yaesus. In 1990 or so I bought a used Kenwood TH-21BT. It only operated on 2 Meters, had no PL (CTCSS) tone, NO MEMORIES (oh the horror!) and no display. You tuned it with thumbwheels and set the repeater offset with a tiny little switch on the back. You could also choose high or low power but high power was only one watt anyway. It had a DTMF pad but that was an option (the TH-21AT had none). The manual for the TH-21BT can still be found online! They still pop up on Ebay every now and then and, with a TinyTrak4 TNC, would make a good radio for a solar powered APRS station since the settings would come back on every power up. After that, and right before the FT-470, I bought one of the new DJ-160T 2 Meter handhelds from Alinco. Literally one of the new ones, the serial number was below 500. Physical design-wise it was a nice radio. The display was on the top, which kind of made it nice to look at when it was on hung on your belt, but it was upside down at that angle. Also operating the radio was pretty easy (here is the instruction manual). That damn radio went back for warranty service three times before they gave up and sent me a brand new one. I don’t know if it worked better because I left it wrapped up and sold it new at a hamfest and used some of the proceeds toward the FT-470. It unfortunately left a bad taste in my mouth toward Alinco, which is probably unfortunate because they have been around for a long time since then and many people like them. They just aren’t the first company I think of when it comes to radios anymore. So this brings us finally to Part 2. If you made it this far, congratulations. If you skipped ahead as I recommended, you did not read this sentence so this statement is moot. So you made it down here. Thanks for that. Now let’s talk about what the perfect HT would be and how we could get there. Note that I am not one of those people who say that “I don’t know why this product doesn’t have this feature” and continue to complain about it because I know about squat about what actually goes into designing something like this. But let’s take that out of the equation here. This thing won’t be a $40 Baofeng. This is going to be a real feature-packed HT. Most of the modern “big three” (Kenwood, Icom, and Yaesu) are nicely constructed radios that can take a drop. 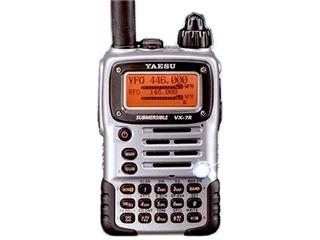 The Yaesu VX-7 and VX-8 line is even submersible. These are small radios, and we’re going to have smallish displays. At the minimum, it needs a dot matrix single-color LCD. I kind of like the Yaesu VX-7 or VX-8 layouts. The Wouxon KG-UV8D has a really nice display (left). However, I think we can do better. OLED technology is here and not that incredibly expensive (but nowhere near as low cost as a standard LCD). 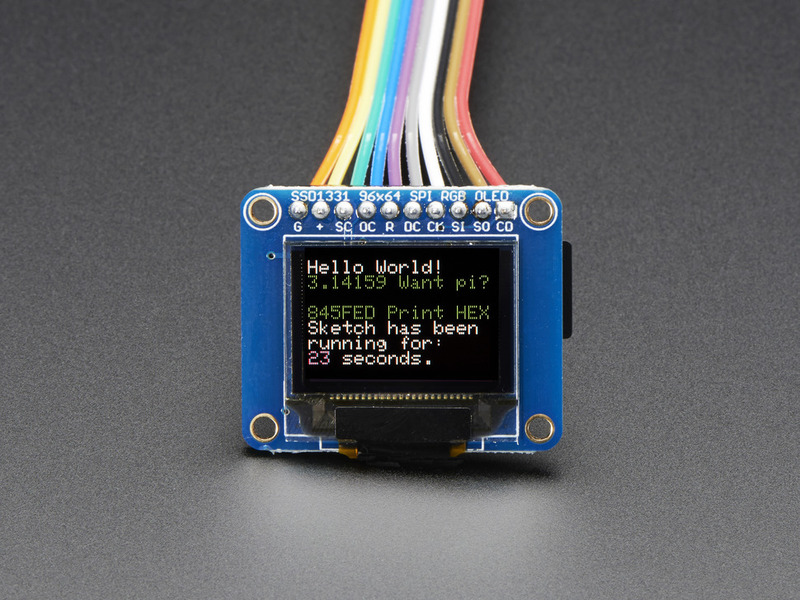 Adafruit sells an OLED development board (picture at right). Imagine what you could do with a display like that on an HT! I’d maybe make it slightly larger. It’s so nice to read, especially in the dark — none of that orange or green backlight on an old fashioned LCD! The display would show both alphanumeric and frequency display at the same time for both the A and B bands, and it would be easy to read APRS messages, D*STAR settings, etc. The ability to programming today’s radios from a laptop is crucial, and mostly this is done over a serial link from a laptop or desktop PC. But sometimes you need to input settings on the fly, or input text for an APRS message or beacon. So why not add a USB connector and plug in a small keyboard? Well, aside from being a big old hole that will affect our submersible rating, it’s a big use of real estate. So, what about Bluetooth? Yaesu offers Bluetooth modules for some of their radios, and adapters are available for others., which enable you to use Bluetooth headsets, effectively almost making your radio hands-free (there is that pesky push-to-talk thing, and nobody really uses VOX, but still). So why not enable adding the ability to use a Bluetooth keyboard? For that matter, you could add a simple Bluetooth heads-up display for APRS use. Even further, you could connect to your laptop via Bluetooth and use it to program your radio, instead of trying to find your proprietary USB cable. 2 Meters, 70 cm, and 6 meter frequencies are natural multipliers of each other which makes it somewhat easy to design a common amplifier. 220 MHz is a little bit harder to add, but I’m sure it could be done. Maayyybbeee you could add 900 MHz, which is popular in some areas. Of course, a wideband receiver. Cellular frequencies blocked, of course (grrrrr). Maybe the advances in Software Defined Radio would help make this all work. Easy. FM, AM (Yaesu did it on the VX-7 on 6 Meters), D-STAR, Yaesu System Fusion, P.25, Motorola DMR (MOTOTRBO). Pipe dream, you say? It’s theoretically possible — CS Systems is promising to deliver their CS7000 which will come with support for FM, DMR and D-STAR right out of the box, and a future firmware update will add support for P25 and Fusion and a few more protocols. Of course they’ve been promising to deliver this for a while. Built in GPS unit and TNC for APRS/DPRS. It may not be possible considering what we want to jam into this radio. On the VX-8DR it can either mount on the top of the radio (looks breakable) or mount on the speaker mic (makes it heavy but puts it up nice and high). USB Charging and Connectivity. Would be nice to be able to charge the HT like your cellphone, from any USB port. However, we may run into limits here. These are high-capacity batteries meant to push out 5 watts of RF. Cellphones eat much less power. Of course, you might have a chance to do this with a 2.1 Amp USB Charger… but you’d probably have to up the voltage a bit to charge this thing. Probably ain’t cheap. I’m serious — we’re asking a lot here. I’d guess $700. And there would be little demand for it. Seriously, we’re competing with the Chinese imports like this Baofeng dual bander for $34 on Amazon. And this Wouxon dual bander for $124 on Amazon. (it has a really nice big display!) And this Anytone dual bander for $69 on Amazon. But it would be awesome. Instant EchoLink access point. That would be kind of cool — using WiFi or mobile Internet, you could start the app and you have an instant EchoLink RF node. Portable Simplex Autopatch. I know, nobody uses autopatches anymore. But they are still legal. This could be done over VoIP or actual cellphone signals. D-Star/DMR/(insert digital mode here) to FM access point. Yeah, I know. Super APRS Support. Y’all know how Bob Bruninga WB4APR (creator of APRS) always tells us that APRS is not about vehicle/people tracking? Well, it actually is. Because that’s what people do with it. Because when you’re out moving around, it’s difficult to use the messaging system on your HT or mobile rig because, unless you have a pre-programmed message that matches exactly what you want to send, you’re spending five minutes inputting your message with a thumb-wheel and buttons. Imagine if you could do the same thing with Swype on Android? Or, even better, a Bluetooth keyboard? We could make APRS everything that Bob dreams it could be! And that would be cool. So, can this be done? Part of it already has. Sort of. Kinda. Not available yet. And probably not cheap. And uses the phone you already have. And there’s this, available on Amazon right now. It’s a smartphone with a built in UHF transceiver. But I bet that the audio is not connected to the Android (although I may be wrong). Would there be drawbacks to an Android HT? Absolutely. I doubt it would be submersible (ever get water on your smartphone screen). And, you know how you hate to drop your phone and crack the screen? You’d really hate to drop this thing. You’re still here? Wow. If you came this far, you probably have something to add. Please comment below! Maybe we can design the perfect mobile later! I like where you’re going with this. My latest HT is the VX8-DR. After adding all the goodies, I’m up around $800 or so and there are still features I’d like to have – many of which you have mentioned. One feature I’ve seen in new radios is the ability to pick close repeaters based on GPS coordinates using the built-in GPS. When you pull a list of repeaters from RepeaterBook.com, they include coordinates. This would be especially useful when using linked repeaters as you drive around. Another interesting feature would be using APRS between two people to find the best common repeater. This could be added as aftermarket software features by enterprising Hams if the radio ran Android. Speaking of Android, I’d be fine with a Samsung Galaxy Note 3/4/5 format radio that was 2-3x thicker to accommodate a larger battery, waterproof case and antenna connector. Two charging options would be nice. One using standard USB power. The second for a high-capacity charger that the radio could operate from.